Having a scooter of your own is the next big thing. Thus, if you own a scooter or intend to purchase a scooter for yourself, then this article is sure to assist you in all regards. In fact, purchasing a scooter might appear to be tedious and baffling job due to the huge proximity of attractive and cost effective scooters available. However, you can always refine your choice if you glance through this list. 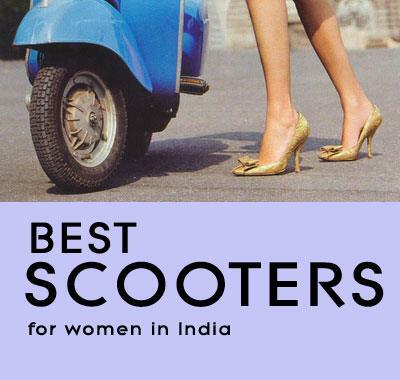 It bears some of the best and the most popular scooters which are absolutely suitable for women. Moreover, with respect to mileage, cost or any style; these scooters are sure to amuse you with their feasibility and effectiveness. Glance through, for better idea of the same. Suzuki Access 125 is probably one of the best and the most 'in' scooters this season. It comes with a beastly 124cc four stroke engine which is innately powerful, thereby offering you a high speed of about 95km/hr. The 6.5 seconds acceleration too is extremely praiseworthy. Apart from this, with its 6 liters of fuel capacity and 160mm ground clearance, this scooter is sure to rule over the heart of all ladies. In fact, in terms of reliability, power, function, comfort and also looks, this scooter totally steals the show. Priced moderately between Rs. 45,000 – Rs. 47,000, this scooter is surely, worth investing your money in. A top scooters list, without Honda is probably impossible. And, Honda too adheres to our hopes and expectations with its innovative and well defined ,Dio. This superbly featured scooter from Honda gives tough competition to one and all in terms of appearance, features, power and also mileage. Priced in a moderate range of Rs. 42000-46000, this scooter with its 106 CC 4 stroke engine is also extremely powerful. Moreover, with the 5 liters fuel capacity and 60km/l mileage this scooter is a best buy. All in all, the appearance, style and mileage of this scooter surely make it an extremely viable product. Activa I turns out to make the 3rd place in this list probably because of its amazing fuel efficiency and style. In fact, this scooter, priced at range of Rs. 42000-47000 is claimed to have a fuel efficiency of 60km/liter which again is extremely commendable. Apart from this, another innovative feature of this is its extremely stylish inner box along with the independent flip up cover. Available in 5 attractive metallic sheen color ranges, this scooter is sure to be your long time companion on the sturdy Indian roads. Read Honda Activa i specifications. The TVS Wego is probably one of the best scooters for women. This scooter is priced at a range of Rs. 45,000-49,000 and, it offers you an amazing ride with its powerful engine and superb speed. Moreover, the mileage of this scooter also pretty commendable. However, despite all of the best features it is advised to modify the disc brake in order to evade any unfortunate accidents in a crowded city. TVS Scooty is the best friend of any and every girl who loves riding scooters. This scooter will definitely not give you the speediest of rides; however it will surely offer you ample comfort and coziness with regard to riding and handling. The scooter with its 135mm ground clearance can pick up a speed of 74 km/hour. Apart from this, it also comes in an economical price range of Rs. 31,000-42000. Moreover, this scooter is also extremely light and hassle free in riding and, like a cherry on the top, it is available in 9 intriguing and peppy colors thereby turning out to be all the more attractive and feasible. Read TVS Scooty Pep Plus specifications. A girl's life is absolutely incomplete without a pink Vespa, and Piaggio Vespa totally proves that you in all regards. Coming with a 125 cc engine this scooter is one of the best and the most feasible purchase for one and all. The seats are comfortable and the appearance of Vespa is pretty more than just cute. In fact, the pink color adds to the girly feel thereby luring you to get hold of this scooter in a jiffy. Apart from this, it is also innately comfortable riding this scooter due to its engine capacity and ergonomic seats. However, priced somewhere around Rs. 70,000 this scooter is a tad too extravagant. Still, if you have totally fallen in love with this cute thing, then you can jolly well get this at home with a little pocket pinch. Read TVS Vespa LX 125 specifications. Read why scooters are ideal for women compared to motor bykes. Are you living in India where scooters have become a need of ours? Then here is article of your attraction. In this article I have come up with some interesting aspects which will help you in choosing a scooter that you deserve. Read about how to choose a scooter, now!